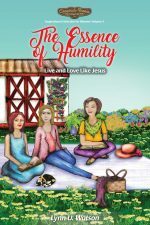 Come Take a Sneak Peak Into The Essence of Humility . . .
My grandmother knew fabrics. Many sought her accomplished skills with needle and thread. 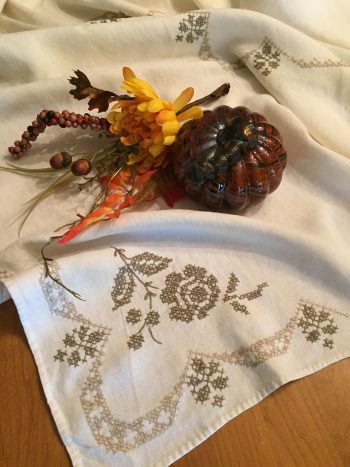 In her later years, my mom encouraged her to embroider tablecloth keepsakes for each of her five daughters and five granddaughters. Grandma worked on many of these during times she stayed at our home. That provided me a sneak peak. Many years later counted-cross stitch gained popularity. My husband, a professional graphic artist, and I designed and published leaflets of cross-stitch patterns — many of the designs quite elaborate and stitched on linen. Naming the collection, I traveled straight back to the conversations with my grandmother. We made a play-on-words, combining my name and my love for linen and the colorful artistry of the butterfly to create “The Lynn’n Butterfly Collection.” I loved color and butterflies, too, and their transformation from humble caterpillar to beautiful masterpiece! When I chose the high-quality cloth and named the cross-stitch collection, the idea of linen’s significance in the Bible never entered the picture. Is it ever significant! I loved the purity and simplicity of linen fabric. No fancy weave — just open and airy — it’s color most often natural or ivory. Those characteristics give it a humble character, creating the perfect background to showcase cross-stitch and embroidery designs and skills. God chooses linen for the wedding gown of the Bride of Christ. Look what it signifies. Let us rejoice and shout for joy! Let us give Him glory and honor, for the marriage of the Lamb has come (at last), and His bride (the redeemed) has prepared herself. She has been permitted to dress in fine linen, dazzling white and clean — for the fine linen signifies the righteous acts of the saints (the ethical conduct, personal integrity, moral courage, and godly character of believers). Linen’s purity and humbleness create the perfect backdrop for the righteous acts of Jesus’ followers — His bride. Others observe the difference in our lives when we are in relationship with Jesus! Integrity, moral courage, godly character, and ethical conduct stand out in our self-serving society. The beauty of a life lived like Jesus lived and loved stands out on its humble background — a beautiful masterpiece!